You are Here: UniPay Gateway > FAQ > Can UniPay gateway handle my subscription billing? Can UniPay gateway handle my subscription billing? Strictly speaking, UniPay gateway is recurring billing software package. It provides a web-based solution to manage customer accounts, handle payments and balances and it can fully automate your recurring billing process. It also provides variety of tools for debt recovery and collections. It supports different payment cycles (weekly, monthly, quarterly, annually) as well as pre-arranged payments and can perform automated reattempts based on predefine settings. While UniPay gateway does offer all of these features essential for recurring billing, it is not an online billing solution. If, however, you deploy UniPay gateway in your existing hosting infrastructure, your company can become a provider of online billing services and offer comprehensive subscription billing to your customers. Your payment gateway questions answered by our team. 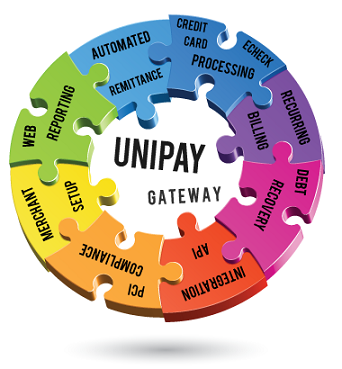 Answer to a commonly asked question of whether UniPay Gateway is an online billing solution. What is payment management? Does UniPay deal with it?